Relevance The heterologous expression of genes in prokaryotes can be challenging, especially if the genes originate from a distant host or if the source is uncertain, such as a metagenomic expression library. Many vectors have been developed based on broad host range origins of replication, but these tend to focus on either gram(+) or gram(-) prokaryotes. 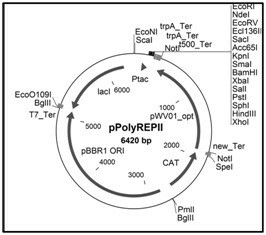 This invention regards the construction of a completely synthetic expression vector, namely pPolyREPII, based on both the pBBR1 (for gram-positive) and pWV01 (for gram-negative) origin of replication, allowing replication in both types of organisms. The expression of pPolyREPII was assessed by cloning the gfp gene with a His6 tag sequence. A strong GFP expression could be observed in various prokaryotes, such as E.coli DH5α, Pseudomonas putida KT2440 and Bacillus subtilis 168. The presence of GFP was confirmed by western blot analysis using antibodies against His6 tag. This novel broad host range expression vector can be equally well used in gram(+) and gram(-) hosts. Thus, this new tool may be used to establish environmental DNA (eDNA) expression libraries and to screen for desired activities in different gram(+) as well as gram(-) hosts at the same time. The vector may allow finding novel biocatalysts, which are not functional in the limited number of vector compatible hosts so far.